“I will accomplish your wish... with magnificence”, says Shinzaemon, the world-weary samurai tasked with a suicidal mission to off the Shogun’s incredibly nasty half brother, Lord Naritsugu; but the quotation could just as well stand for the manner in which Takeshi Miike’s splendid Samurai film despatches what could have been a hackneyed story with genuine élan and humour. The plot can be quickly told. Shinzaemon is called out of retirement to assassinate the young heir and rid the Shogunate of the genuine menace of the Nero-like psycho. There is a bit of political jiggery-pokery; Lord Naritsugu’s (Gorô Inagaki) villainy is established beyond question. Shinzaemon, played with brilliant humanity by veteran Japanese actor Koji Yakusho, gets the gang together. A nicely diverse bunch are established with a wonderful economy - a Ronin, a slightly louche nephew, a reliable old friend, a comic pair of students, and so on. Each has their own motivation, but usually in the key of redemption. A synopsis such as this will not have many people gasping at the originality of the proceedings. And yet from the opening Hari Kari scene, Miike shows himself to be the consummate craftsman, knowing full well how to use quietness to prepare the ground for the excessive violence to come. His long filmography (he is credited with 83 titles on IMDB) is a testament to his prolific output, often making two or three films in the same year. 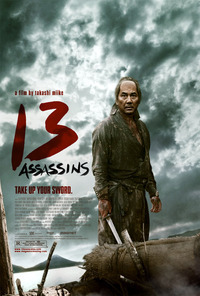 In 2010 he released both 13 Assassins and Zebraman 2: Attack on Zebra City. Best known in the West for his gross-out cult Yakuza Manga adaptation Ichi the Killer (2001) and the terrifying Audition (1999), he has also tried his hand at costume dramas, a western and even a horror/musical, 2001’s frankly mad The Happiness of the Katakuris. This review was published on April 29, 2011.